Buildings need a comfortable indoor temperature and air quality, temperature levels in industrial processes needs to be regulated to the point, goods in storage and transport require a controlled atmosphere – these are only a few examples where heating and cooling is essential in a modern society. Far too often both services are still addressed separately. Boilers are installed to heat up, air conditioning and refrigeration equipment to cool down. Rarely are both seen as two sides of the same coin. As a consequence, energy stored in waste air or water is discharged to the environment and thus lost for further use. If in a building, hot water is heated by a boiler and an a/c system is used to cool down the indoor air temperature, energy is wasted. If in an industrial process, fossil energy is burned to provide heating in step one and then an intermediate or final product is cooled down, energy is wasted. If industrial production facilities are cooled by cooling/refrigeration equipment or close-by offices are heated by separate appliances, energy is wasted. In short, whenever heating and cooling requirements are solved independent of each other, without taking a system perspective, the likelihood of wasted energy is high. Heat pump technology provides heating and cooling at the same time, always. It is a matter of proper system design to make use of both sides and thus turn the one-way road of energy use into a circular energy economy. The potential of closed cycles is particularly high in industrial applications. 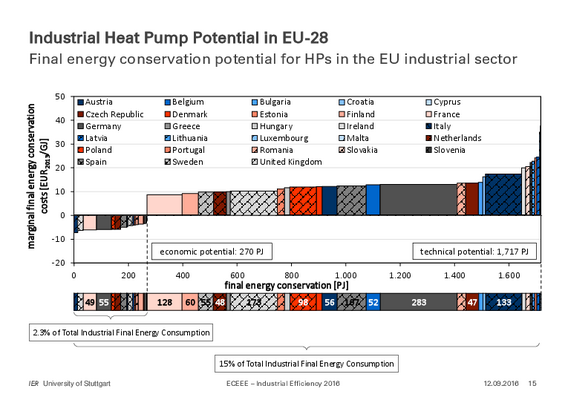 In 2015, the industrial and commercial heat pump working group (ICHP) of the European Heat Pump Association has studied the potential of non-domestic heat pump applications for heating and cooling. The authors of that study, Philippe Nellissen and Stefan Wolf have dubbed the report „potential for an industrial revolution“ . -	reduce energy demand and CO2 emissions. -	integrate renewable energy and help decarbonize the system. -	can make use of waste heat. -	provide demand response potential and help stabilize the electric grid. -	use local energy and reduce import dependency. Heat pump technology is widely accepted as a feasible solution in the residential sector where they mainly use renewable energy from air, water and ground to provide heating and hot water. Much less known is the opportunity to valorise waste heat streams by upgrading their temperature and thus utilize them to cover heat demands of users located close-bye. 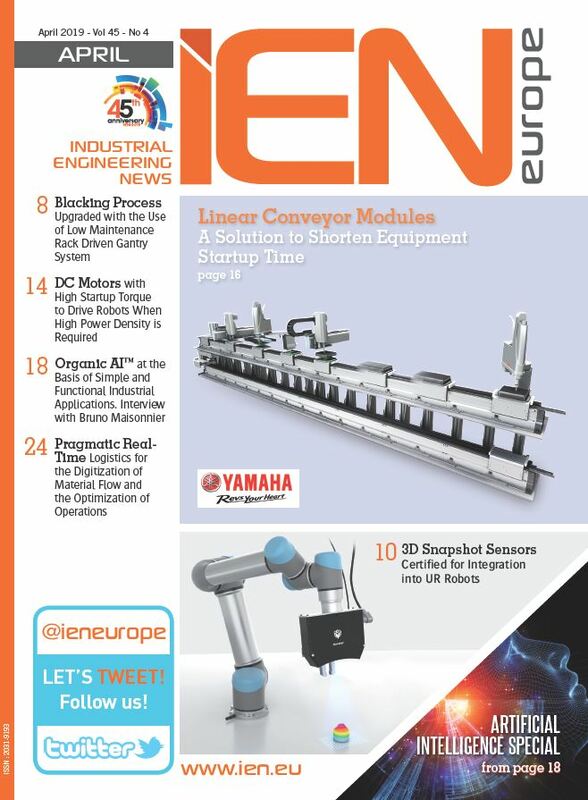 This applies wherever cooling and heating are needed simultaneously for example in many industrial processes in the food, paper or chemical industries. Heat pump technology can increase or lower the energy level of these sources to the desired level of another application, thus connecting individual energy loops into a cascade which can eventually be closed again. 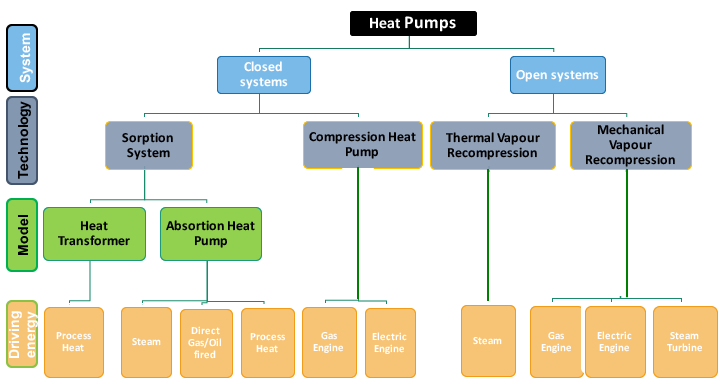 While the residential heat pump market is dominated by electric compression heat pumps, a variety of heat pump technologies are used in industrial and commercial applications (see fig. 1). With the currently available technology, heat pumps can provide heat on temperature levels up to 100°C with a spread between source and sink temperature of approx. 50 K per stage. This is important to note, as two stage heat pump installations can cover a larger spread. The use of heat pumps for applications with a heat demand above 100°C is still a challenge. While the underlying principles for such heat pumps are known and prototypes for these temperature levels exist, they are not yet available in standard products. The current level of research and development projects as well as increased interest by new players to engage in the segment of large heat pumps leaves room for optimism. In the coming years, a number of new products is expected in the market. Without existing solutions for heat pump applications for temperature levels above 150°C this segment has not been included in the current potential assessment. 2012 data for EU-28 reveals, that the industry is using 3200 TWh of final energy and a demand for heat of approx. 2000 TWh. 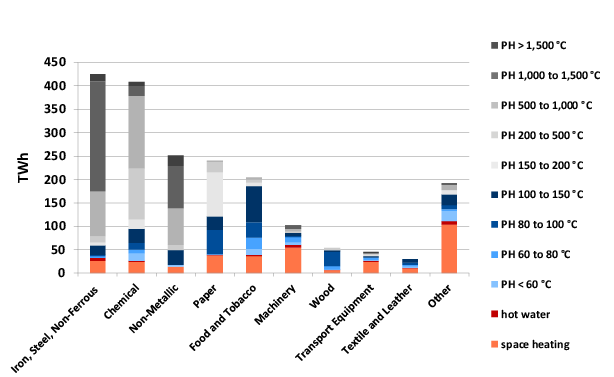 Figure 2 shows the split of this heat demand per sector analysed and temperature range covered. This assessment reveals a practically reachable potential for heat pumps in the temperature range up to 100°C of 68 TWh, mainly in the chemical, paper, food/tobacco and wood industries (see blue shaded bars in fig. 2). Adding the sectors of hot water and space heating reveals an additional 74 TWh (see orange shaded bars in fig. 2). With technical progress, an additional potential of 32TWh in the temperature range from 100 to 150°C can be made accessible (see darkest blue bar in fig.2). In total, 174 TWh or 8.7% of all heat demand in industry can be provided by heat pumps. The result of this assessment shows the realistic potential of heat pump applications. The technical potential is much larger, but can often not be fully used due to practical considerations.